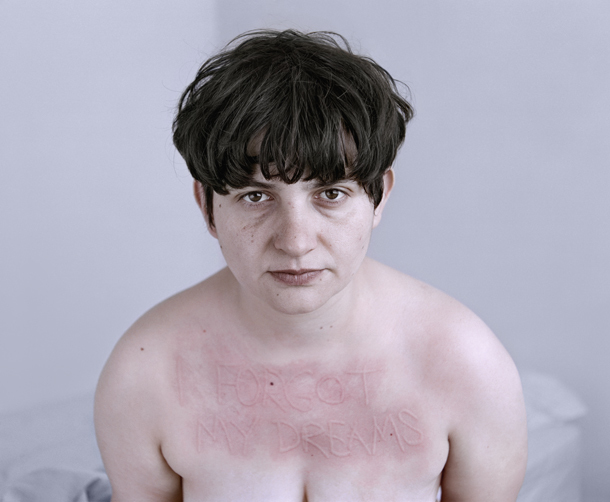 "My own body and thoughts are the basis for a critical examination of society’s expectations to do with identity, surrounding issues of age, gender and family. All of the thoughts scratched onto my skin are related to not fitting in and the feeling of anxiety arising from this displacement. The surface of my body portrays how these thoughts, which come from outside, find their way not only into my psyche but also into my own body image. 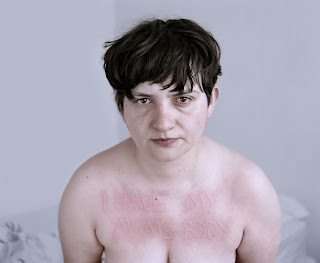 My skin condition, dermographism, means that the surface of my body can be inscribed as if it were a slate. In the same way that early morning thoughts linger for a short while before they disappear, leaving a slight trace that remains throughout the day, my skin slowly goes back to normal over the course of the day and is ready the following morning to be re-inscribed. It is not only this malleability of the skin, that interests me, but also the idea that skin absorbs information from the outside world; it is the interface between the self and others, both separating us and becoming the physical link between our bodies."